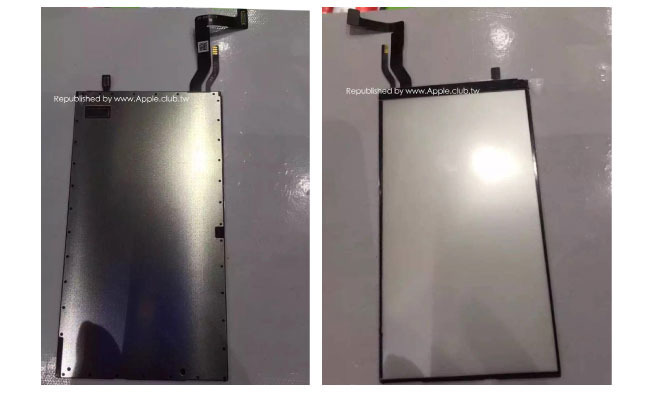 A series of images making their way around the Chinese internet on Wednesday purport to show a backlight assembly intended for Apple's next-generation iPhone, with a tweaked layout that suggests an updated design for the device's 3D Touch sensors. Compared to the backlight assembly found in the iPhone 6s series, the part shown in the photos bears relocated flex cables and what seems to be a slightly moved contact for the 3D Touch hardware. The photos were taken from social networking app WeChat by Taiwanese blog Apple.club.tw. There is one distinguishing mark suggesting the part belongs to an as-yet-unreleased Apple device —a small Apple logo can just barely be seen on the largest flex cable. Apple is believed to be working on a new force sensing technology for its mobile devices, primarily aimed at the iPad series. Industry insiders believe that 3D Touch has yet to make its way to the tablets because of problems scaling the complex designs. The technology is "one of the most severe production bottlenecks in iPhone 6s supply chain," one analyst notes. If Apple does debut a new scalable 3D Touch technology, sources have indicated to AppleInsider that it will not come with the so-called "iPhone 7." Rather, it would debut alongside what would be the iPad Air 4 or next-generation iPad Pro. Update: This article has been updated to note a small Apple logo marking on the part's flex cable.